Toddlers love to hear their parents read out loud. Story time combines some of your child’s favorite things: snuggling, interesting illustrations, and your voice. At this age, story time can be more interactive. 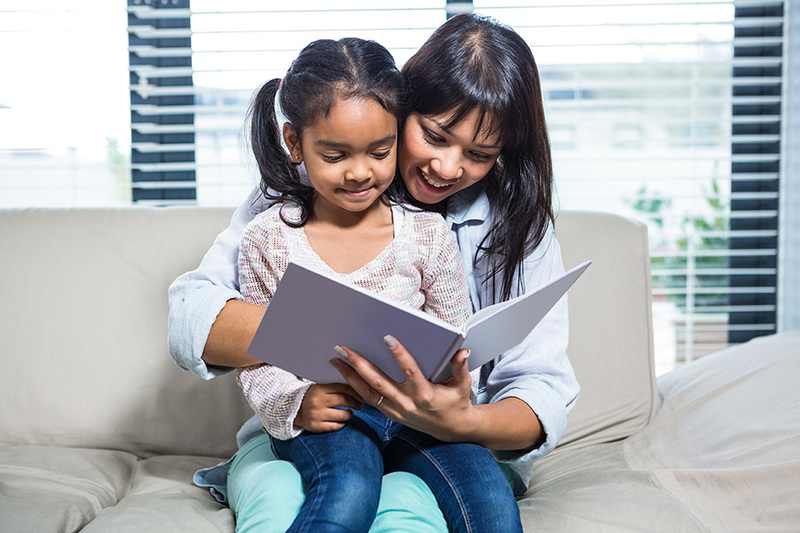 Your toddler can repeat favorite phrases, request multiple readings of a favorite book, and point to colors, animals, and objects as you read their names aloud. To get the most out of story time with your little one, try implementing the “Three T’s.” Talk, track, and turn. Next time you open a book together, try out one or more of these simple activities to keep your little one engaged and learning valuable literacy skills. Talk about your own experiences such as your family, pets, or community when you are reading a story. Talk or sing about the pictures. You do not have to read the words to tell a story. Try “reading” just the pictures in a book for your child sometime. When your child is old enough, ask him to “read” the pictures to you! Track print from left to right with your finger. Children aren’t born with an innate knowledge that text is read from left to right, or that the words on a page are separate from the images. Essential pre-reading skills like these are among the major benefits of early reading. Turn pages together. Toddlers enjoy physical activity, even turning pages. It will also help them understand how to match the written word to the spoken word. Board books with stiff pages help small children master this motor skill. Lift up the page with your finger just a bit when you’re ready to turn the page but then direct your child to finish. Snuggling up with a book lets the two of you slow down and recapture that sweet, cuddly time you enjoyed when he was a baby. Instead of being seen as a chore or a task, reading will become a nurturing activity that will bring the two of you closer together. Set aside 20 minutes a day or schedule story time at wake up or bed time. Make it as routine as brushing teeth! Before long, your toddler will look forward to story time as one of the best parts of the day. Once your toddler understands that story time is a kind of playtime, you’ll have started him on a lifetime of book loving and learning.